making/keeping friends and fitting in? understanding others' points of view and feelings? interpreting body language and facial expressions? solving problems calmly and appropriately? making the same social mistakes over and over? applying the rules of social behavior to himself? 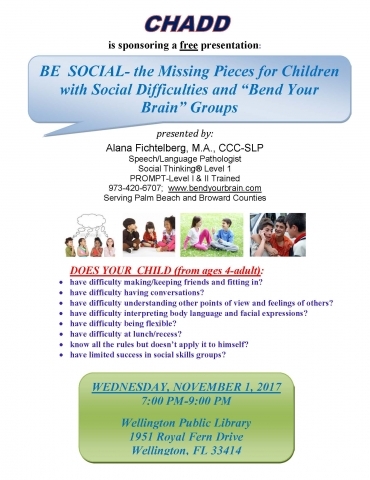 Find out how your child may benefit from Social Thinking®, used in Bend Your Brain™ Social Learning Groups. to students in Palm Beach County, Broward County, and surrounding areas. Bend Your Brain™ is the property of Bend Your Brain, Inc.